Grandview-Woodland slated for rezoning under the draft community plan is being rushed through for approval by City of Vancouver council before the end of July 2016, only four weeks after public release. Every part of the neighbourhood will be affected. • The Vancouver housing affordability crisis is being addressed by a rush to zone, on the false premise that unaffordability is being caused by a lack of zoning supply. This is like the former Bush administration’s rush to war with Iraq, based on false information about Iraq’s “weapons of mass destruction.” Vancouver’s rushed actions, based on false information, are causing enormous damage to our city. Rampant rezoning to add zoned capacity is driving speculative land inflation, which is further exacerbated by unregulated foreign capital flows. The fact there already is ample zoned capacity to meet future growth must be considered before going further down this road. Governments are reluctant to address the real causes of unaffordability, such as foreign capital flowing into real estate and selling citizenship through Quebec’s foreign investor program, whose investors land in Vancouver. These are disconnecting residential prices from the local economy. Instead, the government points to simple supply and demand economics, despite the fact that is no longer working. Those industries that promote this status quo are primary contributors to campaign funding that elected parties rely on. Increasing zoning to allow more housing supply will not make prices drop, especially not when the demand side is coming from outside of our local economy. Generally, land values are a big part of Vancouver’s crazy real estate that causes unaffordability in both existing and new development. By increasing zoning, it drives speculation on land values, which increases property prices, overall. Regardless of whether or not a property is developed, the new development potential gets priced into the land. This is then part of any property sale price or becomes the expectation of an existing owner for a return on their investment. If they are not getting enough return, rental rates will be raised to make it worthwhile. Or they will demolish and build new. New rental apartment development is often twice as expensive and a fraction of the size of existing affordable units. New houses are usually twice as expensive to buy and much larger in size. Not to say there should never be any rezoning. But what currently exists should first be very carefully considered as well as what would be gained or lost if an area is rezoned. Since development pressure adds increased inflation, which means more expensive housing, rezoning is generally not in the public interest. Existing rental buildings are often bought on speculation that the City will be removing its decades-long Rate of Change requirements of one-to-one replacement of rentals. If anything, in this climate, the Rate of Change policies should be expanded, not reduced. Governments often use the excuse that more zoning supply is necessary to meet anticipated growth. However, this is not the case in Vancouver. Regional planners have estimated how much population growth there will be based on current and past trends. The updated Regional Growth Strategy (RGS) estimates the population of the City of Vancouver will increase by 148,000 from 2011 to 2041. Emphasis is on the “over” 20 years. 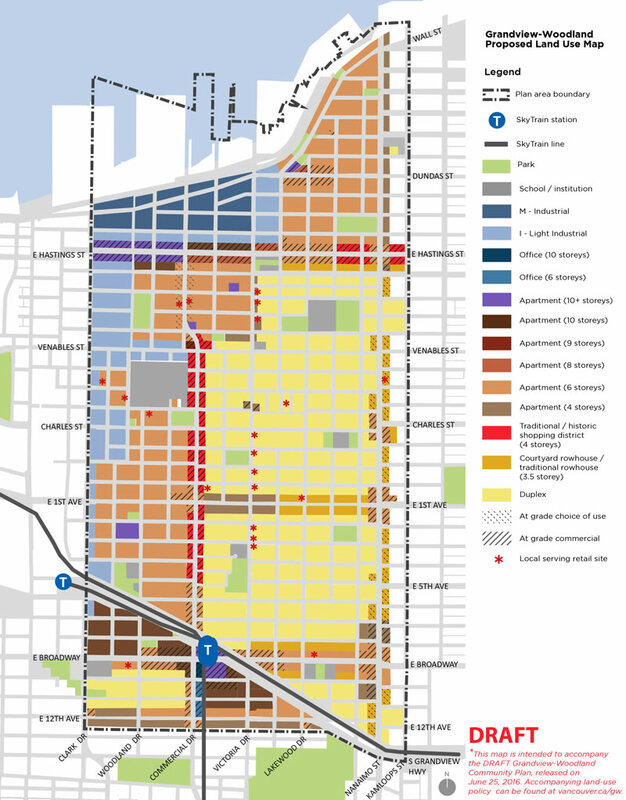 The estimate includes only a small portion of the zoned capacity, mostly concentrating on either recent multifamily zoning, or an estimated percentage that is likely to be built out. They are projecting the existing record pace of development will continue into the future. The report was intended to show that supply was not restricted by city policies. And it certainly has not been. The report did not consider that all “single family” lots can have three units – or the capacity in RT duplex/infill zones. We also have to add the further substantial rezoning that has taken place since the report was completed in June 2014, two years ago. The full-zoned capacity is, therefore, much bigger than the amount included by the consultants. So if there is already so much zoned capacity, why rezone more affordable neighbourhoods like Grandview-Woodland (the Drive)? This is a good question, especially when the Drive already has so many existing affordable rentals, co-ops, social housing units and multi-suited heritage houses. The proposed plan was only released publically four weeks before it was scheduled to go to council for approval before the end of July. The plan draft is 250 pages plus many other reference documents that would be a challenge even for a trained professional to review. 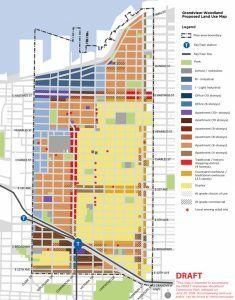 The plan proposes increasing most of the apartment zones, currently 3.5 storeys, up to six storeys – Hastings St. increases range from 10-18 storeys (Clark to Commercial) and 4-10 storeys (Commercial to Nanaimo). Increases around Broadway are 10-24 storeys. Every area in the neighbourhood would be affected. At the community-packed Grandview-Woodland Area Council (GWAC) meeting on July 11, many concerns were raised. Long-term renters were in tears over the potential redevelopment of their homes. Shane Simpson, MLA, said clearly there needed to be a delay in passing the plan until into the fall, perhaps to November. Others pointed out that any delay needed to ensure that further community input was reflected in a revised community supported plan. Adriane Carr, the lone city councillor who attended, said it may be possible to delay if the community requests that. Here’s hoping the city listens. The priorities should be incentives for retention and adaptive reuse of existing heritage and character buildings. As heritage advocate Michael Kluckner says, “You don’t build affordable housing, you retain it.” This is an important principle that should be applied across the city. And be warned, the city is working on their cookie-cutter zonings to continue carving up the rest of Vancouver, including Kitsilano and the Westside next. The article is not promoting to stop growth. It is just pointing out that there is ample existing zoned capacity to accommodate the anticipated growth. Zoning supply is not the problem. Increasing zoning is part of creating the land speculation driving unaffordability. Regarding foreign investment, that is also contributing to the affordability crisis as Bob notes. Real estate has become disconnected from the local economy. You’re right Kyle – the population of Greater Vancouver is growing. It almost always did. But never in the past the ratio of home prices and people’s earnings was so huge. This is called bubble. Two main inputs to this bubble development. 1. There is no restriction/regulation regarding foreign buyers. The government shows no respect to Canadians at all. Only small fraction of real estate should be allowed for foreigners – the rest should stay for domestic consumption. This is done in some more civilized countries, e.g. Swiss, but not in Canada. 2. Absolutely reckless and un-sustainable financial policy of the central bank. Money has been made a cheap “give away” for banks and credit to the public. Majority of Canadians are obsessed with debt backed buying spree. And of course real estate is on the must have list of almost every family. As a result, Canada now is one of the leaders in both debt and real estate bubble in the world! A small push and we’re the winners! Definitely all our recent gov. worked hard for thus to happen. Needless to say that the gov. is the only beneficiary of this situation: big unearned money from taxes, property deals etc. Needless to say that the gov. is not going to solve the bubble problems and restore market forces (which by the way would get back real estate affordability as a side effect, and most probably there will be no need for re-zoning). When the real estate bubble will burst it will hit hard all Canadians in a big way (including speculators). Does the gov. care about this is probably a rhetorical question. Kyle, you too are missing Elizabeth’s point – there is the ability to produce much more supply within existing zoning, which will limit land speculation pressure on the market. Also, affordability needs to be protected with policy restrictions to support tenants and regulate new development – supply is not a magic wand without it. Kyle, you are not getting it nor understanding. By building more… does that drive the prices of housing down? whilst foreign buyers are buying these new units? Will you and many young Vancouverites be able to plunk down the 25% downpayment on units that will start at 375K-450K and competing against those outside buyers who pay for it all in one shot! In short: building more, will it bring the prices down? Answer is NO. Market will be driven HIGHER as buyers from outside keep buying them up. That is the bases of MARKETING. This marketing can be motivated politically and golden hand shakes. You fail to understand that the population of Metro Vancouver is growing and if we don’t add more supply prices will rise as people compete for limited housing options. Please consider the disastrous effect your ill-informed Logic will have on housing affordability in Vancouver. As the city grows in population size, we need to grow in housing unit numbers. Kyle – There are more people on this earth who wish to move to Vancouver than the city could ever possibly accommodate, so rezoning the entire city for greater density will not stop the inevitable rise in real estate prices – but it will make the city less livable for everyone. There is a limit to densification and it must stop sooner or later – I say stop it sooner before the area becomes impossibly crowded.